In my yarn swatch story, here's the next installment. (If you aren't interested in this, skip to the next paragraph!) This here is O-wool Classic, which I heartily recommend. It's a flexible 'plain vanilla' fine wool yarn, which means I knit it up on #8's and saw it could be knitted down on #6's or up to #9's or more with ease. By fine wool, I mean soft, and it says it's Merino, but not as fine as extra-fine Merino. It's got spring and cottony softness, and it smells a bit of spinning oil. When it's washed, it puffs up into this lush soft hand that's hard to beat. It comes in lots of colors, it's Organic, which is a great thing on many levels, and this swatch is knit using Elizabeth Zimmermann's Snail Hat concept, only I made it into a wee mini-skirt. This, and all its swatch buddies, are now winging their way back to the folks who need the swatches for the TNNA convention. I still have the remainder of these balls of yarn to play with, and I'm looking forward to that! Anyhow, the CT scan took an hour from beginning to end, and showed that things appear to be working on my insides. Whew, what a relief! However, medicine is still an art, not entirely a science. Nobody can explain why I've had lingering pain or why it took so long to get better. At the moment when the specialist suggested just one more procedure, just to do more research...I hesitated. He was called away to the hospital's operating room for an emergency. I was relieved. I'm slowly getting better on my own. I think, for now, I'll stick with what's worked. I've had enough of feeling like the medical equivalent of a tough riddle. (Yup, I stump the doctors...) caption: Here, Sally the dog demonstrates what is working for me! Rest. Lots of liquids. Good food. Lots of staring into space, reading interesting books (I recommend Naomi Ragen's books) and doing minimal amounts of work. I imagine this old fashioned approach does work sometimes. The professor suggested an ice cream cone to celebrate the success of all this medical testing on Friday, but even the local ice cream shop is closed for the unknown holiday of Dec. 28th. Grumble... Good thing we had treats at home. I mean, I'm all for religious holidays, I take them very seriously, even as an interested observer if, like Christmas, it isn't my holiday, but closing the ice cream shop until after New Year's? humph. Yesterday we ventured out for Greek food and to run a few errands as part of the effort to increase my strength after all this couch sitting. I scored 3 cashmere sweaters for $30 a piece. OK, I have a sweater fetish, I couldn't help myself. Two v-necks--one dark blue and one black, and a black hoodie. Wow. Don't worry, I spared you that photo. It was, umm, dark. In a few days, I will rise up, off the couch, and Sally, off her dog bed, because we're going to visit our folks in NYC and DC. I'm focusing a lot of energy on being able to handle the trip. I hope it will be a lark! Another swatch story and other adventures to come in my next installment. In the meanwhile, just in case I don't post that in time, have a super, happy and healthy New Year! When bamboo fibers and yarns came out a couple of years back as this great new product, I was confused. I wanted to like this renewable resource--I bought some bamboo fiber, and spun it. It spun up fine but I didn't enjoy it. It had enormous tensile strength, thus making it completely unnecessary to ply it. It was a little hard to spin evenly. When I finished the sample, I used it to tie up tomatoes, and for other twine-like repairs. (it is biodegradable) It's anti-microbial properties and great drape seemed lost on me. I liked ingeo, cotton, and even that clumpy soysilk better. Flash forward to this past September, when I knitted a ribby shell out of Madil Eden Bamboo yarn. Hard on the fingers, and, alas, not as nice looking as good ole mercerized cotton. Strike #2. However, I am always a yarn optimist, so when I got sent Classic Elite's new Cotton Bamboo yarn to swatch, I rushed to see it worked up. It knits on size 5 needles, and it shows stitch definition well. (I used a zigzag pattern and a textured rib) It wasn't as hard to knit as the Madil Eden, and it didn't unravel quite so much as I knit it. It has a nice luster. Downsides? It is a droopy yarn. Nice drape, but if you made a tank top with this, you'd best make it tight, with a textured stitch., or the armholes would be, umm, at your waist. Next came SWTC's Terra. I loved this stuff, or at least, I liked it as much as I can get myself to like anything that is mostly inelastic. I knit it up at 6 sts to an inch on a size 5(3.75mm) and it felt like my favorite summer option? mercerized cotton. Great body, interesting coloration in the dye, and oddly, much the same fiber content as that other yarn, above. Another example of the endless variations available to knitters these days. Really interesting to see the differences. This swatch is in the form of a sleeve, so I did ribbing at the cuff, and a fern lace pattern which really looked good in this yarn. Terra has good potential for summer knitting projects! Yesterday's big adventure was a trip to our favorite Chinese food joint. What's the traditional thing for Jews to do on Dec.25th? Chinese food and a movie! I didn't make it to a movie, there wasn't anything in the theaters here I wanted to see, but took a long nap instead...still fighting these weird occasional fevers. We did enjoy how quiet things were, aside from the multiple arguments on the street. It seems that when folks here have domestic disputes, they do it outside. Holidays are a big time for this. Usually under our bedroom window, at 2 AM...except for the older gentleman and his adult daughter, outside in their pajamas, arguing this morning on a main road. I noticed this while we were out walking the dogs, at 9 AM. (yes, I am pushing myself to exercise again, and while it is tiring, I think I need the stimulation) I find these public arguments a real mystery, especially when everyone is talking about "Peace and Goodwill!" Do you suppose they were raised to "take it outside!?" Remember all the swatches I mentioned I would be knitting, earlier in the month? Well, no reason why I can't talk up these new yarns here, that I know of, so here's the first installment. Almost immediately after going off my antibiotic, I felt like eating again. Here's a peach and apple bread pudding, dotted with brown sugar and pecans. Complete list of ingredients? frozen peaches, two apples, leftover challah cut into chunks, 3 eggs, 1 cup of vanilla soy milk (we were eating this with meat), margarine, some relevant spices (baking spices, including cinnamon) and those pecans and brown sugar. Mmmh good...tasted better than it looks, I think. I'm off to dinner. The professor cooked, so I could write to y'all. Thanks for all your warm well-wishes!! I hope all of you who observe that holiday on Dec. 25th have a meaningful one! Dreamscape. That's what it feels like, the bubble I'm living in, ok in the morning, achey and sometimes painful in the afternoons and evenings. Each day I take on one or two things. Yesterday, I made bread for the first time in a while. It hurt to move the cast iron dutch ovens in and out of the oven...but the fresh whole wheat bread was satisfying. Good tasting, and I haven't been that into eating, so that was worth it. This morning, it was running errands...on a very small scale. I went to pick up our vegetables for the week. During the winter, we're lucky to be able to buy locally grown, fresh vegetables that are grown under large hoops, sort of like cold frame farming. It's the opposite of buying from the grocery store, driving 5 miles to a farm just outside of town, visiting with the farmers, meeting their cats and dogs, and writing a check for something that was grown right near by, without pesticides or chemicals. I came home with several heads of lettuce, 3 lbs of new potatoes, tatsoi, and broccoli. Sometimes I'm in the rotation to get some of the coveted winter eggs (hens don't lay a lot this time of year) and if I'm lucky, I'm offered a bunch of baby carrots, a couple of carefully nurtured tomatoes or another treat...rare because it hasn't been shipped from anywhere, sheltered from cold and grown right here. By the time I stopped for milk, and went to the drug store, that was it for the day. Whew. Wiped out. The day feels hazy, warm, blurry around the edges. At home, I submerge my nose in the fur of my dogs as I pet them, that special musky smell that each dog has. The smells of each are distinctive, different. They smell the "invaders" who I visited with on the farm on my pants' legs. The greens, brightly irridescent in a way that only just picked produce offers, glimmer as I put the bag in the refrigerator. Writers are supposed to read a lot, and that's what I tell myself as I dive headlong into Diana Abu-Jaber's new book, Origin. I drink milky tea, fondle yarn, wool, and dogs' ears as I walk by, to cuddle back into my bed clothes. My attention span is pretty short, so I knit just a bit in the evenings, and my spinning wheels are idle until it isn' t such work to treadle. I'll keep working during this break, and keep editing and writing things to send on to my editor, so that Fiber Gathering is a reality in just over a year, but maybe just not today. My brain hasn't stopped. The rest, the body? is on a bit of a strange journey. Home feels ok, and an hour's worth of errands seems about as far away as I want to physically go. My heart feels light when I think of all the kindnesses sent my way, thoughts, prayers, and messages, while I retreat here. I look at the comments, look at those dots on the map, and feel connected to all of you, even while things here are quiet and I'm resting with dogs, alone. The latest guess is that I have been having pyelonephritis, aka, a kidney infection. However, most people would be healed up by now with the amount of antibiotics I've been on...I haven't yet. When I was born, I had birth defects related to kidney and bladder function. I was lucky to be born in a time when these could be fixed and I went through three surgeries by the time I was five. As an adult, I realize how scary this experience must have been for my parents...they were wonderful, creating sticker books and writing stories with me about my experiences to help me cope with it. I took stuffed animals with me into the operating room and my Playskool stethoscope sometimes got mixed up with the real doctors' stethoscopes. The remarkable thing was that the surgeries worked, and I have been a healthy person with a pretty substantial notion of my own good fortune ever since. Except, every so often, I get really sick. The last time I was this sick, nine years ago, it was right after a lot of stress and travel, it took me a month and a lot of antibiotics to get better. This time, I suspect I've been sick for at least that long, and well, it was probably stress and travel again...although the worst book stress, in June and July this past summer, had long passed by the time this started to be a problem. Since I'm not really better yet, I'm scheduled for another test next week to see whether something more than an infection is wrong with my insides. Still and all, nine years is a good long run between these sorts of significant illnesses. So long, in fact, that it didn't occur to anyone straight away that this was what might be wrong...and that's probably why it took me so long to figure it out, too. When I was a senior in college, I had my first significant committee interview, in January 1995. It was ill-fated, from the psychological exam down to the ice storm that kept me from getting home afterwards. However, the illegal question that was asked first at that interview is one I never forgot. I'd written an essay as part of the application process, and I'd explained how grateful I was for life and what joie de vivre I offered to others as a result. I wrote about luck and skill; of being born at the right time to have these surgeries and to have this skilled surgeon operate with a magnifying glass on my two year old insides. That illegal question? "So, do you think you and your kidneys will make it through rabbinical school?" The answer, then and now, thirteen years later, is of course, Yes. More importantly, no one can predict these things, when we might become ill, or just get run over by a bus while crossing the street. Despite meeting all the right qualifications on paper, I didn't get into rabbinical school, and I'll probably never know why. (believe me, I've asked) Instead, I taught public school in far more dangerous inner-city neighborhoods, earned a couple of graduate degrees, became a writer and designer---and once or twice, yes, I've had some infections. I'm going to hope that's all this is, that it's nothing more serious this time. In the meanwhile, I am still working every day on submitting parts of my book to my editors. And, if this is something more serious, well, I've done some things I'm really proud of...and I'm generally excited to wake up every morning, to spend time with the professor and Harry and Sally. Writing, teaching, designing, being alive--all pretty great. The strings that hold us to this rich life can be fragile ones. I'm going to tie a knot, and hold on. Wow! I guess I should talk about this serious stuff often. Y'all have a lot to say. Oddly, when I read all the comments from the last post, you'd fleshed out the whole hard issue. Is it that marriage is hard? Taking responsibility? Managing divorce or single parenthood? It's all hard, and well, my readers are smart folk. Thanks for engaging in the issue with me. We may not be able to solve all these problems, but it sure is nice to have an intelligent conversation about it. I searched around diligently through stash and online trying to find a good match, a contrast ing or coordinating fleece or yarn. Then I came to my senses. I've obviously had enough of this project, matching zipper and all. I looked down at myself, wearing a (non-matching) scarf with the sweater, and said, "OH." 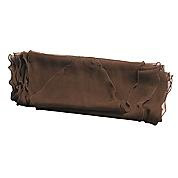 I went online and ordered this scarf in brown and black. (brown might not match, but a silk scarf or two? Always useful.) Now that mine's on its way, here's where you can get yours!! I mean, just in case someone else needed a good scarf. Let's hope this works. It sure seemed like a painless solution. Finding solutions is satisfying. Like a moment where you find the perfect kitchen utensil or the scissors or whatever, and feel so happy that it worked. Yesterday the electricity went off at my folks' house in Virginia, and my parents built fires in the fireplaces to keep my grandmother toasty. My mom didn't want to leave the fire unattended, so she stayed up and read with a wind-up flashlight. Sometimes, the right tool is all it takes. My sweater with the zipper is done...the slip-stitch cardigan that I designed out of my handspun. I have a vivid imagination and this yarn was so delicious...I imagined something perfect. I loved the fleece, loved spinning the yarn, and even enjoyed the knitting. Yet, I'm sad to say that sometimes I finish a perfectly acceptable sweater and feel let down. It's not....(insert something here) right. I wanted a plunging v-neck but not too plunging, a bulky lofty yarn in a flattering pattern for an average sized shape, a zipper because I thought it would lie flatter than a series of buttons. Also, 782 yards of handspun (all the wool that was left from this fleece) only allowed for a very deep neckline. As it was, I used tiny bits to finish the short rows in the v-neck edging. There just ain't no more yarn! When I washed the zipper and dried it, it dried with a ripple or two which haven't yet flattened out on my body. This photo, shot with the detritus of my knitting corner in the background, is small because I'm not thrilled with any of the photos AND I don't think photos are so flattering when one isn't feeling good. I'm considering some sort of neckline addition in another yarn--just not sure about that. What do you think? All of your encouragement (and a shove from my mother and best friend) motivated me to contact my kind primary care doctor. He got me an appointment right away, and then scheduled another with a specialist soon, along with handing me additional antibiotics. He was honest, maybe this was out of his league, but that no, I wasn't imagining anything, there's probably something else wrong. I'm hopeful that I will heal up soon. In the meantime, it allows a lot of time for thinking and knitting. I've been wrestling with a different issue regarding imagination and reality. Recently, I've heard of at least 3 couples who are likely to divorce. In several of these, I've observed highly competent women, who are juggling mothering and work as well as most of the household tasks. The current state of our gender (in)equality is stressful and taxing for women who don't get support from their spouses. That lack of support is excused by underlying "traditional values." It's made worse by the ever increasing individuality emphasized by our society and its commercial culture--of course there's leisure time to play golf or video games, watch every channel on TV or to party with friends or alone. There's also no time for community building activities, that seem to support people when they actually need the help. The reality is that childrearing, housekeeping and working require much of our attention. Plus, if one wants to maintain a relationship and a community, that takes work too. Without honest community members to keep us in line, we sometimes lose touch with what's important. (family, not computer time?) It's not all fun and games, despite what it looks like on TV. While feminism means that women should be allowed equal access to everything that men do, it doesn't mean men are excused or exempt from those same activities. Living in one's imaginary world all the time --without a reality check--sometimes breaks up marriages, households, and children's lives. My reality? The professor's great at assuming responsibility when I've felt sick and unable to cope with much more than the book deadlines and my health. He's done the chores, from buying the dogs' kibble to doing the laundry and making dinner. (He's also good at ordering take-out!) I'm lucky to have this, but it takes work for both of us. In collapsing marriages, sometimes a woman often shoulders all the burden, and wonders whether it's necessary to remain tied to an unsupportive spouse. I wonder what's going on societally that makes this sort of mutual, positive spousal support seem unusual. One result of feeling too sick to do anything other than sit on the couch? A lot of mindless knitting... Here are the plain black mittens, as requested by my sister-in-law. This was probably 10 hours of knitting pleasure, knitted in Jo Sharp Silkroad Aran, and I squished it down to sizes 3(3.25mm) and5(3.75mm) dpns to be extra warm. I hope she wears them for lots of fun snow ball fights and other winter adventures. Hanukah is winding down and my big effort, dinner for all the professor's lab research students and their guests, went well. It just about made me keel over (taking down dishes from the top shelf of our breakfront for 14 while having a fever? bad idea) but we'd been planning it for months, the professor helped a lot, and all had fun. Every single student came, and left smiling after loading up on dinner, doughnuts, chocolate gelt, and dreidl fun. I spent all weekend resting afterwards. I'm still fighting some sort of infection, and have been told by the gynecologist that if I don't get better after this bout of antibiotics, I should see my primary care physician. She's apparently done treating me. I've never had a doctor just wash her hands of me in quite this way before. (ahh, healthcare in KY!) Luckily, I like my primary care physician and if things don't improve, I'll see him next week. I'm stunned that when I called her office, saying, uhh, I'm 6 days into antibiotic #2 and things haven't improved? The result was an adult version of "stop bothering me with your questions." Hmph. Good news, I got my first advance check from the publisher yesterday! This means I can soon pay my bills for this Fiber Gathering book, like paying the designers who have contributed. Gone are the days when an advance would be useful for things like keeping a writer fed and warm! In my case, when I receive the whole advance, it will just about cover this book's expenses. That will be breaking even--no salary this year from this project. I'll hope everyone and her sisters buy copies of the book instead. It's essentially a business investment in my future career. Another present that came in the mail: Yarns for me to swatch. Every year, members of the Association of Knitwear Designers are offered an opportunity to volunteer for this. TNNA, a big trade organization for the knitting industry, has industry conventions which feature the "Great Wall of Yarn." Yarn companies pay to have their yarns featured, and send in yarns to be displayed. I get the chance to see some of the new yarns, knit up small samples, and possibly make connections in the industry. I'm not a member of TNNA itself (can't afford that business decision just now) and have yet to make a firm industry relationship this way, but I love playing with the yarns. This year? I've got all natural fibers, including two organic wools. Fun work knitting ahead, and I can tell you all about it! The professor's giving his Genetics students their final exam at very this moment. Soon he will be able to work at home more during winter break, or in the completely empty Biology department. This time period will include frequent rests with Harry while they consult the 2008 seed catalogs. This is one of his wintertime hobbies. It gives him something to do in the dead quiet we face this time of the year, which we often work right through. We've had a super Hanukah this year--it's a pretty lowkey holiday--and it'll be over by tomorrow night. Remember to say hey every so often! I see you're visiting but don't get many comments..keep me company over here, 'kay? caption: Best Friend's new living room in Vermont. Check out all that rich textile activity on the walls, floor, and bottom right, on the coffee table? My handspun, being knit into an afghan by my best friend! Now, Donna tagged me for an interesting meme, but it's taken a while for me to do it. Thanks for thinking of me, Donna, these are interesting questions! My blog turned 2 years old on November 30th. I forgot that was it was a blogiversary! Sorry now that I missed the chance to celebrate something…but yes, two years. My big city brother-in-law Ben and a family friend, Sandy, suggested I start a blog years ago. Of course, in Manhattan, they always know about this stuff first. I stalled, because I wasn’t sure if I wanted to keep a “public” journal, but I thought it might be worthwhile. I kept a daily journal from age 13-25 and mostly stopped when I got married. I missed that writing routine, and this blog offers something similar. Plus, I get lots of positive interaction with others. Mentors? I am inspired by Stephanie Pearl-McPhee, Annie Modesitt, Kristin Nicholas, and Deb Robson, but these folks inspire me—with or without their blogs! There are lots of blogs that inspire without knowing the writers personally, too. In a sense, freelance writing and knitwear design are both personality-driven businesses. So indirectly, yes, I’d like to make money from my work, and maybe the blog helps. I occasionally mention my designs, articles, and other excitements on the blog, but I doubt that is lucrative. I don’t run any ads on the blog, and according to an internet marketing consulting I met on an airplane, with only 50 visitors a day, it might not be worth it. My original concept was to tell stories, (yarn spinner, get it?) with lots of fiber arts content. I think that has only partially succeeded, because it turns out that I can't post about a lot of the projects I do for magazines, yarn companies, publishers, etc. so I don’t look nearly as productive as a knitter or spinner as some other blogs, but it's fun anyway. I get a lot out of posting and reflecting on stories and issues that concern me. I love the comments people offer me, too. 4. What 3 things do you struggle with online? 1)Public versus Private persona. What do I want to tell the whole world? 2)Weird or scary emails, phone calls, and letters, which I get occasionally..not because of my blog, but because of my online presence. 3) Walking the line between writing interesting posts and being overly self-absorbed or pushy about my work life, which is largely dependent on the ‘net. 5. What 3 things do you love about being online? 1) It reduces my isolation—I’m lucky to have made many friends online. 2) It’s instant gratification. I can talk to the world quickly, and in return, folks might talk back. 3)In some small way, it may help my career, and I’m grateful for any boost I get in that way. caption: These closets (and slate floor) are right outside my best friend's bedroom. My first thought? Look at all that knitting and sweater storage! Would you like to do this meme? I'd be interested in what Terri, Denise, and Alison H. think, but I'm not forcing you to do it, or anything, OK?! When you're inside watching it snow in Vermont, it's good to be in a beautiful house. My best friend's grandmother, Elizabeth Brouha, was an artist. She attended an arts school in Belgium and brought her riches, her belief in art education, and beauty, to Vermont. She and her husband left Belgium right at the brink of WWII, in 1940. They bought this land in Vermont, and slowly made it their own. I don't remember this lady very well, as kids often don't know adults. In fact, in my mind she was a brusque, no-nonsense woman, but seeing her art and design as an adult opened my eyes to her amazing talent. In this picture of the living room, you can see a mural. (click on it to get a bigger image) Elizabeth Brouha painted it. Then, she painted a needlepoint canvas, and needlepointed this chair to match. At this point, the chair is a little sunbleached, and it's in need of restoration. Does anyone know a skilled textile restorationist, who could stablize this and restitch the worn parts? Obviously, this chair should be around for a lot longer, it is amazing. In my house, things are no where near so beautiful! I am on a new antibiotic and hope it will make me feel better. The good news? It's Hanukah (thanks for your well-wishes!) and we are taking time each night for a little revelry. Last night, it was Chinese Carry-Out, some of it fried, (we'll get to latkes later on, I promise) and my mom sent me several Elizabeth Zimmerman books as a present. I even had time to knit on the couch! When feeling under the weather, there's nothing better than that. No snow here in Kentucky, and for that, I'm a little sorry. I love me some snow in the winter time. On Friday, the professor's lab research students, grad students and undergrads, will come over to celebrate the end of the term with us. I'm baking challah (for the second time, I screwed something up first time around!) and will cook up a big meal for 15...or so. This is probably the total of our Hanukah education efforts for this year. I've been a bit busy working on the book to organize a public gathering this time around. More on my trip and other excitements in the next installment. Whoa, A whole needlepointed armchair---can you imagine doing that!? The best friend (we've been friendly since about age 12 and close since we turned 14) lives in another rural area of Vermont, and we travelled there on Saturday, stopping for important trips to buy good Vermont cheese and other groceries, see a great juried art show, and then, we headed to "town." It was 2 degrees F when we went out to dinner near Dartmouth College in New Hampshire for my best friend's boyfriend's birthday on Saturday night. The views from the Sutton farmhouse are beautiful, and it was only the beginning of the adventure. I took several photos, and it will take a while to show them all. The reason for the short post? You may have heard that New England got some snow over the past few days. Maybe about eight inches to a foot of snow fell on Sunday night, and it kept snowing. On Monday, they cancelled school and the roads weren't plowed, but I still had to get to the airplane. We left my best friend's house at 10 AM ET on Monday morning. I got home to my house in Kentucky at 12:30 AM, CT. That's over 15 hours in transit, on three airplanes, and my travel plan was rerouted twice. I'm bushed. Knitting accomplished? A woman's large mitten, all but the thumb, 5 sts to the inch, black, for my sister-in-law. Did that on the trip to New England, and it took 5 hours, more or less. I started the ribbing on the second mitten, but by mid-day yesterday? I'd even lost the will to knit. Thanks for the well-wishes regarding health. I'm still not quite right yet. More to come on my great New England adventure...so, where you live, did you get any of the white stuff? !